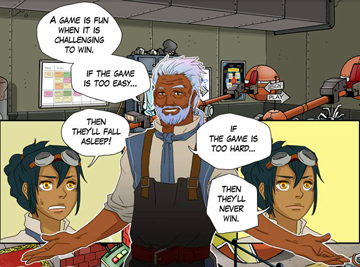 The three Quests in Gamestar Mechanic tell the epic story of Addison, a budding game designer living in a world where everything is powered by games. The main story of the Quests are told in comic cutscenes, which are fun and also tell the players a lot about game design. Students are often very intent on getting right into playing games, so they skip over the comics. One way to make sure students get the most out of the cutscenes is to use the PDFs. Print the comics you want your students to study and go over them together before going into the Quests! All comic PDFs are attached to the bottom of this page. (Addison can be played as a female or male avatar, so we have two versions of each comic - female or male). At the bottom of the page you can also find the comics with blank speech bubbles. Use these to have your students write in their own dialogue! (These files are marked ND).